On May 29th 2018, THALASSA joined the initiative of the ECOMERS laboratory (CNRS; University of Nice Sophia-Antipolis) to organize an educational day for 2 primary classes of a school in Nice. 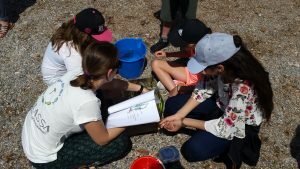 A class of CM1 and a class of CM2 gathering 52 children between the age of 9 and 11 had the opportunity to discover the fauna and flora of the Mediterranean Sea through a series of activities at the “anse des fossettes” of Saint-Jean-Cap-Ferrat. In the morning, several aquariums were installed on the beach and enriched with sea water and benthic organisms harvested thanks to the scuba divers of the ECOMERS team. 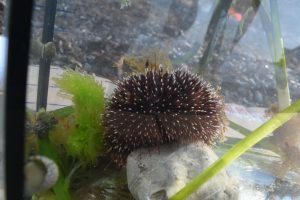 We explained the importance of the Natura 2000 network of the Saint-Jean-Cap-Ferrat and then, in small groups, kids explored the diversity of organisms harvested: macroalgae, plants, echinoderms, gastropods, cnidarians and small crustaceans. Many questions were raised and it was an opportunity to share with the children the richness of Mediterranean biodiversity and to raise awareness about its conservation status and the respectful behavior to adopt daily. In the afternoon, the ECOMERS and THALASSA team organized several educational workshops. In small groups, we introduced several themes by means of games such as “Who’s who?”, a fun way to learn about the diversity of living organisms on our shores.